Updated on October 11th, 2017: The Air Jordan 11 “Win Like ’82” releases on November 11th, 2017 for $220. Every holiday season, the Jordan 11 returns in one of the most anticipated releases of Jordan Brand’s yearly retro release slate. Any thought that the brand was running out of ideas have been shut down this year as the Jumpman is rumored to release not one, but two patent leather gems to hold you down, and both are entirely new colorways rooted in Michael Jordan’s past. Today we get the best look yet at the Jordan 11 Midnight Navy scheduled to release on Black Friday, November 24th for $220 USD. While the pair carries a traditional UNC Tar Heels theme throughout, it does so in an entirely new way. We’re breaking down the finer details with the best preview images yet courtesy of Marquee Sole as the specifications might surprise you. From the patent leather shape and size to the stitching on the iconic Jumpman branding, the Jordan 11 Navy shows that Jordan Brand isn’t afraid to mix things up while keeping a few things on the more traditional side. Check out a complete guide to the Jordan 11 Midnight Navy below and stay tuned for more updates as we get closer to the November release date right here on Sneaker News. The new Air Jordan 11 Midnight Navy colorway is an obvious homage to Michael Jordan’s alma-mater – University of North Carolina – thanks to University Blue Jumpman branding and a white base. The shade is a little lighter when compared to the Columbia 11 retro from a few years ago (then known as the Air Jordan 11 Legend Blue). UNC has also used a Midnight Navy shade sparingly on their iconic argyle printed jerseys from time to time. This appears on the lining, heel, and patent leather mudguard for a standout look that’s never before appeared on an Air Jordan 11. Unlike last year’s Space Jam 11 retro, Jordan Brand will not be reversing the Jumpman branding on the left shoe this year. Instead, we get a more traditional look where the ball is facing the ’23’ PE branding on the heel for the left shoe instead of flipping the opposite direction to match early samples of the patent leather model. 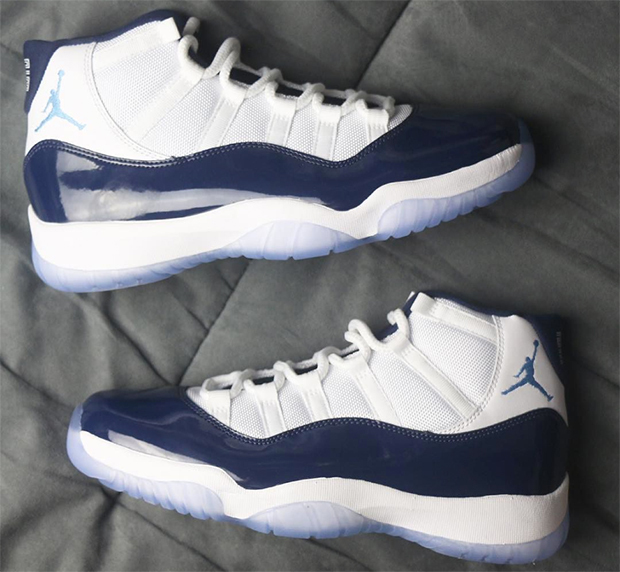 The Air Jordan 11 Legend Blue from 2014 features a noticably lower patent leather profile. This was the case for a number of Jordan 11 retros until Jordan Brand retooled the look for the Space Jam release. Last year’s Space Jam 11 also featured ’45’ on the heel in an homage to Michael Jordan’s first comeback. While plenty of people applauded that detail, Mike’s original college and professional number 23 is back once again, contrasting the Midnight Navy lining in a clean white. So When Will You Be Able To Purchase Your Pair? Currently, the Air Jordan 11 Midnight Navy is rumored to release as early as Black Friday, November 24th, 2017 for $220 USD. This frees up Jordan Brand to release another Jordan 11 retro for the Christmas 2017 season with the Air Jordan 11 “Gym Red” colorway confirmed for a December 16th release. The Air Jordan 11 Midnight Navy will drop in a full family size run and as is the case with most Jordan 11 retros, the brand makes these readily available by producing a massive quantity. Adult sizes will go for $220 USD.